The chances are that many of the things in our homes arrived in Britain on a ship. Our washing machine, TV, those oranges, that frozen fish in the freezer. 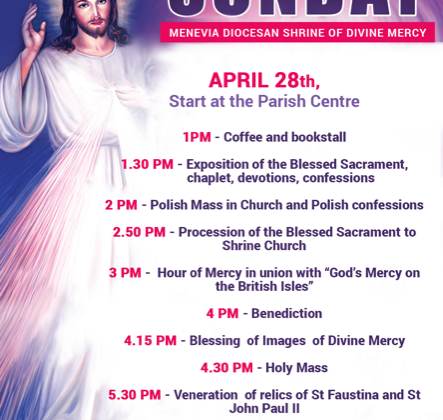 First Sunday of Divine Mercy at the Menevia Shrine of Divine Mercy, Church of the Sacred Heart Morriston. In the presence of over 200 guests, Bishop Tom Burns welcomed the Apostolic Nuncio, Archbishop Edward Adams, to a MEET THE DIOCESE evening in Swansea, South Wales, as His Excellency began a 3-day Pastoral Visit to the Diocese of Menevia. television on Monday evening the fire raging through the roof, and the spire disintegrating piece by piece, I felt a lump in my throat. The Diocese is a small but ancient Christian Community, that can trace its roots back to St.David and the very origins of the Celtic Christian tradition. Today it aims to incorporate and preserve the best of that rich seam of tradition in a diverse, vibrant and multicultural society and all the challenges and opportunities that it brings. The website is not only a place to access practical information about the Diocese and “what’s going on”, but also where to learn more about our Church, the Church in the World, and also help us to reflect on our Christian faith and vocation, and what it means to be disciples of Jesus Christ and proclaim his “good news” of Justice, Peace, Forgiveness and Love in our world today. It is very much a “work in progress”, and so if not all the information is immediately accessible and some pages remain under construction, please bear with us. A particular apology in advance to those of you who would like to access information in Welsh – due to the sheer work of translation the Welsh version of the website will not be up and running for quite some time – and if there is anyone ready and able to assist in the work of translating at least the essential pages, please do contact us. But the Diocese remains committed to providing a fully bilingual service as much as resources allow. That is the mission of the Church, and this website should be, above all, an instrument towards achieving that goal, together. Welcome to our new Diocesan Newsletter. This newsletter is intended to inform you of events that are taking place in the diocese every month.